I’ll jump into this once more, but in reality I’m fighting a losing battle. As we’ve seen in recent years, people have started to believe any old crap. Facebook and other social media sites now seem to be the font of all knowledge, despite them usually being a massive echo-chamber of shallow attention-seeking comments and misplaced loyalties. Who created this image? Has it been checked? Is it factually correct? No, they just believe that the EU are forcing us to have straight bananas and share it. You can read his wordy Wikipedia article for the truth or hey, you could just click “Share” and, some half a million shares later, the damage is done. The official pro-Brexit campaign broke the law by overspending. Nobody seems to care though, because “somebody else” should do the fact checking. Right? Wrong. We’re losing trust in our traditional media. Newspapers aren’t fact checking as much as they used to. Their industry is being sucked down a hole. Circulation figures are tumbling, revenue is vanishing. You have to pump out articles throughout the day on a website now. They must be instant, but lengthy, contain countless pictures and – above all else – their main purpose should be to attract attention and encourage visitors to click. The headline must get a click. It has to pull you in. Another click. Another few pennies in revenue. More Google Ad impressions. More money for the owners of the newspaper. Welcome, then, to typical modern journalism. It’s much easier to pay less for “reporters” to turn tweets into supposed “news” than it is to actually go out and properly investigate something. Newspapers have less money coming in, so they spend less on researching in-depth news and concentrate on articles which recoup the most amount of cash. The result is articles that earn a fortune for the likes of the Daily Mail but are thrown together with little concern over accuracy. Meanwhile, we expect our news to be free, meaning that there’s less money floating around for in-depth investigative items. And hey, who needs those? 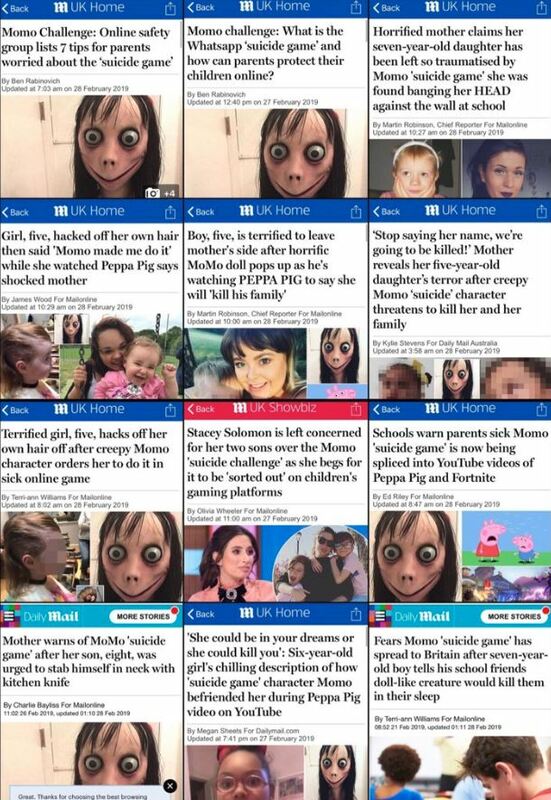 A well-researched, long-form news piece will get far less clicks that the 12 articles about this “Momo Challenge” that have simply been lifted from social media sites. ..which then gets peddled by the press, which then gets shared all over and suddenly explodes into ..
…followed by the campaigning, hounding and harassment of any female working in TV on social media or real life and so on. 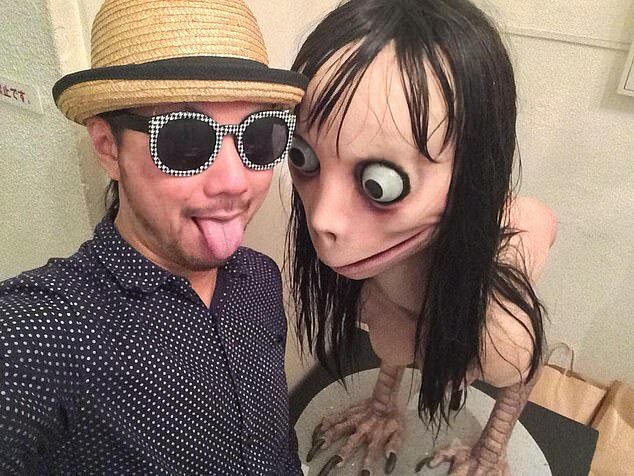 Today then (and yes, I’ve taken the longest possible route to this final paragraph possible), it’s been revealed that there’s no hard evidence stating that the Momo Challenge is real. This “challenge” supposedly revolves around a character jumping into YouTube videos (even Kids YouTube) plus WhatsApp and other places, encouraging kids to harm themselves, perform dangerous activities or hide things from their parents. Children have had their schools sending home letters, the Scouts have done presentations about it, the Police and local authorities have jumped in. Kids are now more shocked and scared than they would have been if somebody had actually done some proper fact checking. If that had happened, and they’d have actually spotted that fact that …. – Charities say there have been no reports of anybody receiving messages or harming themselves as a result. – The UK Safer Internet Centre states that it is “fake news”. – Newspaper articles claiming that “up to” 130 teenagers in Russia had been killed were not corroborated by the relevant authorities. Now those news stories have amplified this false scare stories, and we’re lapping it up because Facebook, Twitter and the likes of the Daily Mail are all free. We don’t want to pay for news any more, so we go for the free option, which is largely unchecked. Guardian media editor Jim Waterson stated..
Now, say what you want about the BBC, at least they fact-check their stories. Now, I must clarify that I’m in no way stating that you should ignore all these warnings about online threats. The internet is a dangerous place and no firewall, no screen time restriction and no parental controls can stop your kids being subjected to bad, hateful, frightening stuff. I’m just highlighting the fact that we should all be more cautious of what we believe on the internet, because in this instance the “trusted” outlets for many have caused more harm. Head to my earlier stories about how to keep your kids mobile safe and online grooming. 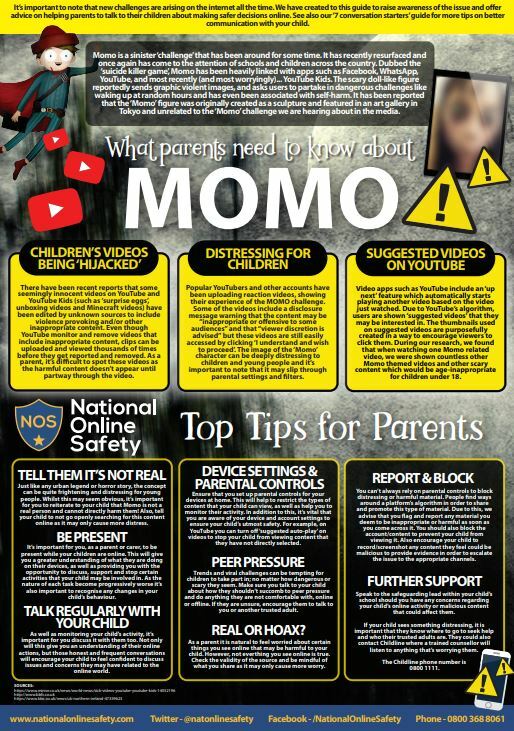 Also check my story last week which details how even apps targeting children are dangerous. The post The Momo Challenge. Yep, here we go again. is original content from Coolsmartphone. If you see it on another news website, please let us know. LG’s more affordable phones aren’t always exciting, but US carriers love them, and sell plenty to US consumers. LG has three new ones this year, the smallest and most of affordable of which is the K40. It’s basically a replacement for the K30. Improvements include a larger, taller display and batter cameras. It also adds a dedicated Google Assistant button and AI Cam automatic scene detection. What’s it like in person? We checked it out. Each year, we trek to Barcelona to check out the mobile industry’s latest and greatest at the industry’s largest trade show: MWC. It’s not all great, so after seeing it all in person, we pick out the real winners for our Best of MWC awards. This year, a lot of exciting phones were announced, including the first commercial 5G and foldable phones. Four of them really stood out. The new Sony Xperia 10 is heading to Vodafone and you’ll be able to get it for just £30 per month with 5GB of data and unlimited everything else (£9 up-front on a Red Extra plan). Also, if you buy before 29th April you can claim a £100 Disney Store gift card. The handset is also up on the Red Entertainment (25GB per month and unlimited everything else) offer for £41 per month and nothing upfront. That gets you a choice of Amazon Prime Video, Sky Sports Mobile TV, Spotify Premium or a NOW TV Entertainment Pass. Whatever you do, if you’re quick enough you can get that gift card and, when you redeem it, you will also be automatically entered into a prize draw to win a trip to an elephant safari in Sri Lanka. 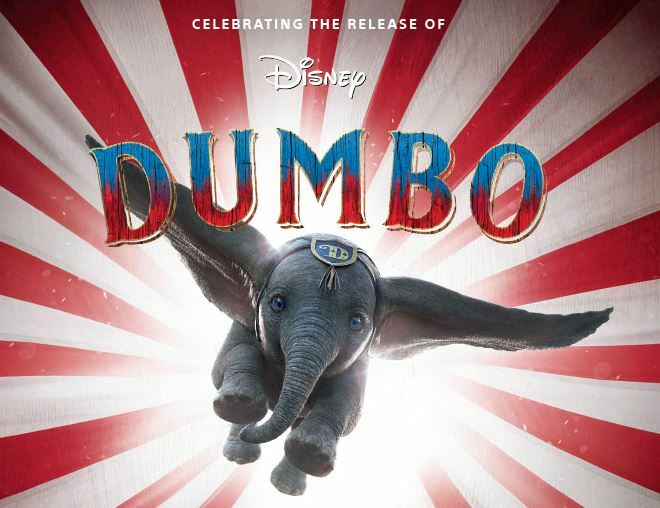 It’s all to celebrate the release of Disney’s Dumbo. 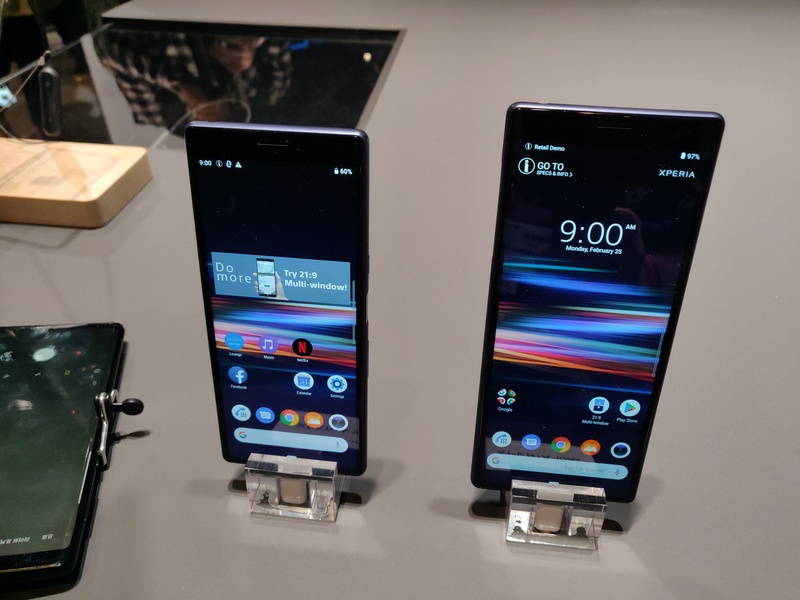 Get more details and a close-up look at the Xperia 10 in our Mobile World Congress coverage here. The post MWC – Sony Xperia 10 coming to Vodafone, complete with Dumbo! is original content from Coolsmartphone. If you see it on another news website, please let us know. MWC – Are you on a stand or booth? Give us a shout! OK, we’ve not done this before. Let’s give it a try. If you’ve paid a lot of money to get a presence at Mobile World Congress and want some coverage here, hit our contact page right now. Here in Barcelona there’s lots of huge halls, so trying to cover everything is near impossible. So, if we’ve missed you and you’ve got something cool that we should be telling the world about, we want to correct that. There’s a definite snow blindness going on with out email inbox right now, so use this form and choose “Hot news tip”. Then we’ll get to you! Hey, and perhaps even if you’re not and you couldn’t get out to Barcelona, we’d love to hear from you too! The post MWC – Are you on a stand or booth? Give us a shout! is original content from Coolsmartphone. If you see it on another news website, please let us know. Nubia has a new smartwatch (actually, a full wrist-phone) with a flexible display that wraps all the way around your wrist. The flexible display aspect is actually pretty great, and works well. 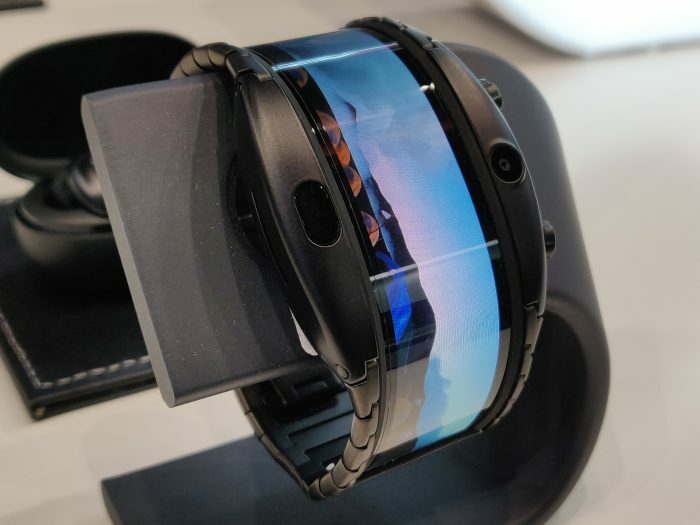 The rest of the product, not so much, but it’s worth checking out just to see a glimpse of what’s definitely coming now that flexible displays are coming to market. Check out our hands-on video to see it in action. Last year we had the pleasure of being introduced a new device to the market in the form of the Gemini, which I was able to put through its paces in an extensive test for a few weeks. I was very impressed by it but unfortunately, with it being a Gen 1 device it had some problems that are often found in first products. This year Planet Computers the team behind the Gemini have been showing off their 2nd Generation device which is called the Cosmo Communicator. One of the major issues I had with the device was that I could not see it ever being my daily driver as the notification method being utilised meant that for me it wouldn’t be conducive to being my main phone for everyday use. This has been addressed with the addition of a second 2″ OLED Touch display that is mounted on the outer casing. This allows you to interact with the device whilst it is closed and perform your more basic phone tasks. In addition to that second display, we also find an outward facing 24 MP camera as standard where it was an option previously. Another feature that I am happy to see is the fingerprint reader on the outer case making for a faster method to unlock the phone in a more secure manner. This fingerprint reader will also pull double duty a toggle switch to answer and initiate calls. These are the main additions to the older design, the good news is that it has kept the feature that made the device unique the number one thing being the keyboard which as also been improved with the addition of a backlight. This is a great addition as it will allow me to work when I need to without having to work about not being in a bright room. I also found that even on the prototypes I used that the keyboard has been developed and improved quite a bit from my previous experience which was nice to see. 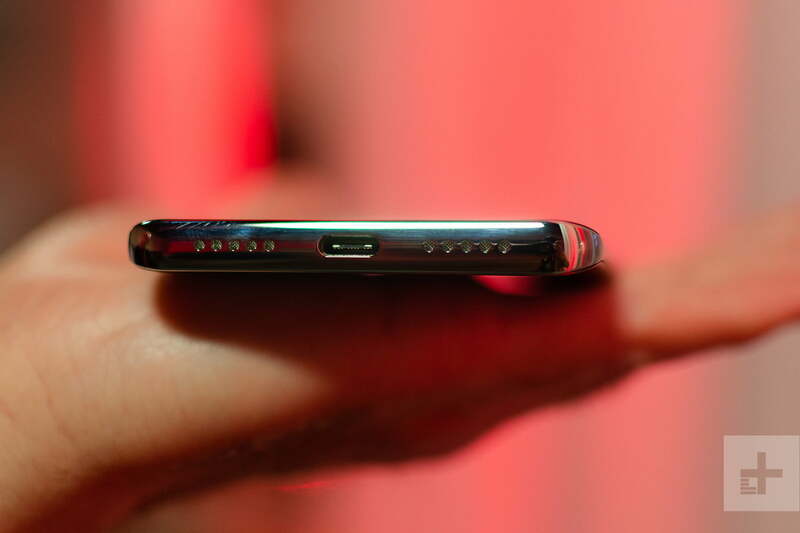 Still present are the two USB Type C ports which are incredibly handy as it allows for this to be used with multiple accessories simultaneously. The other major updates are to found internally. The processor has been updated to now be the 8-Core Mediatek P70 processor which is assisted by 6GB of Ram and double the storage to 128GB memory which can, of course, be expanded by a Micro SD card. Graphics wise we find an ARM Mali G72 graphics processor allow for great productivity on the device and when connected up to an external display. The device will also be running on Android 9.0 Pie allowing for you to ensure that you are running the latest and best possible version of Android. The OS is also accompanied by some pre-installed Planet Apps and the Planet taskbar for quick launching your regularly used apps. Lastly, we now have the addition of NFC for use in contactless payment using Google Pay and this will also allow for fast and easy file transfers. So that is about all I can say about the improvements as I mentioned the units I was able to use were all prototypes so I was not able to use all of the features but I was impressed by all the additions over the Gemini and it does make the Cosmo a viable option for use as a daily driver. Time will tell if I can actually do that and this is something that I hope to test once the device becomes available. As for the Gemini device well things have not been standing still there either as Plant Computers have been developing the software and are now very close to having the green light in the rollout of Android 8 onto this device. That, however, is not all as it was announced yesterday (25/02/2109) that a new Desktop interface has been developed for the Gemini, it is called OXI. This will allow the user to plug into an external display and run all their existing app’s in a desktop style environment allow enhanced multi Window mode and other benefits. OXI will be available as a subscription when you purchase the official HDMI cable (adaptor) from the Planet Store. OXI for the Gemini PDA will be available when purchasing official HDMI cable from the Planet store. 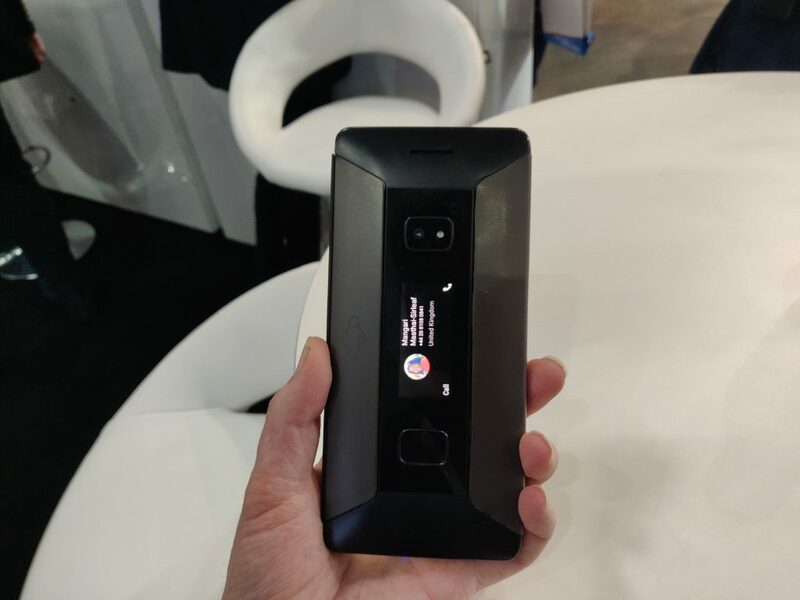 By the looks of things, it will work in a similar manner to what we have seen from Samsung and Huawei in the form of DEX and Desktop Mode respectively. In addition to being able to run the apps on your device, you will also be able to run full apps via emulation if your setup to so. This opens a massive possibility of getting work done. So that about rounds up the latest developments from Planet Computers, Hopefully i will be able to revisit this when the new device goes into full production and we can answer my question of will it be suitable as my daily driver. 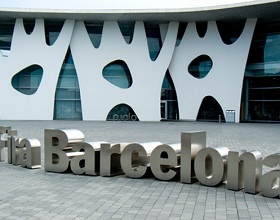 Barcelona, 25th February 2019: Planet Computers is exhibiting at Mobile World Congress 2019, as part of the official UK delegation. Planet will showcase Cosmo Communicator – the latest product from Planet Computers. 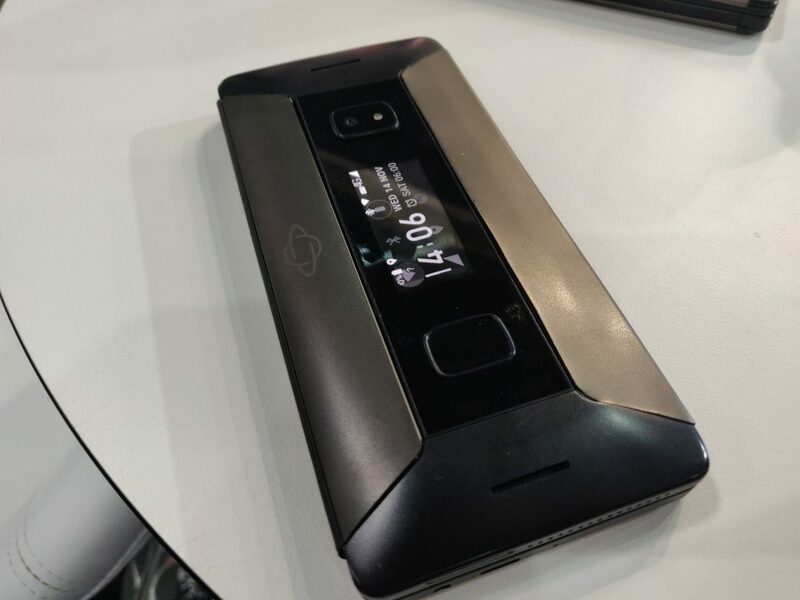 Cosmo is a clamshell smartphone with external and internal touchscreen displays and a physical backlit keyboard. Cosmo is designed to be a true all-in-one communicator, with dual 4G connectivity, a high-resolution camera and a full QWERTY keyboard. 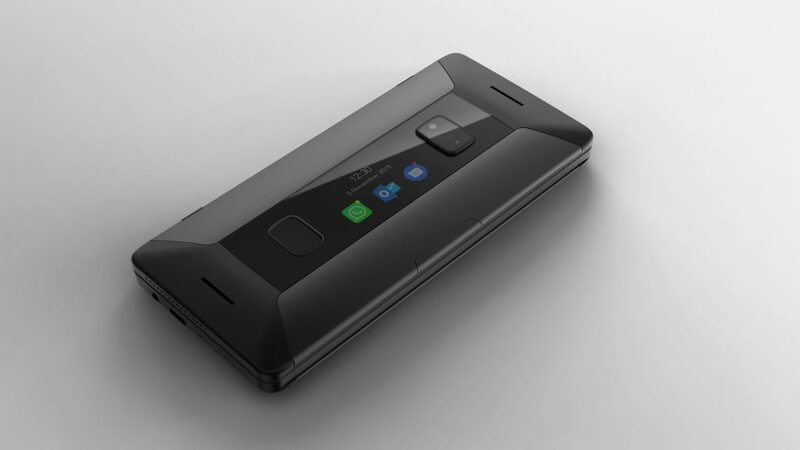 Cosmo is the second handset developed by Planet Computers, following the successful launch of Gemini in 2018, which raised more than $2.5 million in investment. Powered by an 8-Core Mediatek P70 processor, with 6GB of RAM and 128GB of internal memory (extendable via a microSD card), Cosmo is powerful enough to keep people connected and productive wherever they are. The device features a large battery for up to two days of use, dedicated voice assist controls, 6-inch internal colour screen, dual 4G SIM capability (physical and eSIM), stereo speakers, two USB-C ports for charging and connecting peripherals, and an advanced ARM Mali G72 graphics processor – enabling users to benefit from the productivity offered by a physical keyboard without needing to carry a secondary mobile device or laptop. 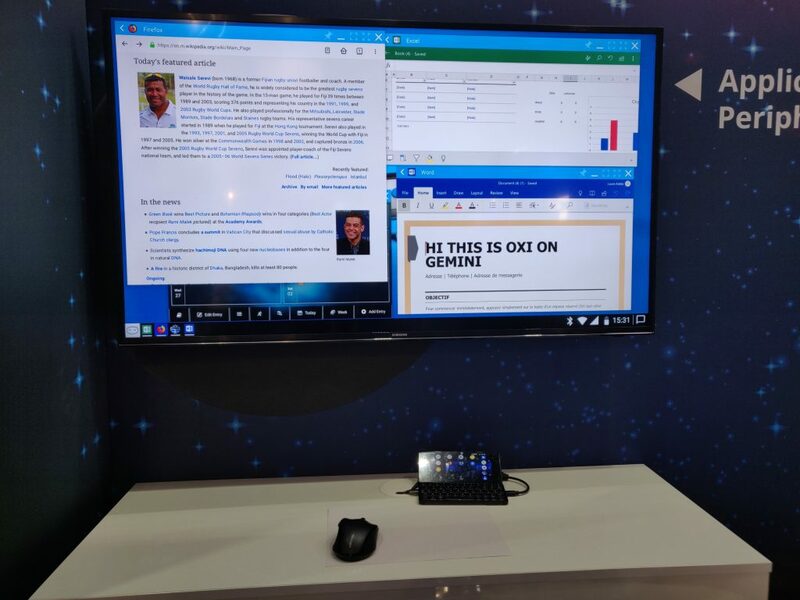 MOBILE WORLD CONGRESS, Barcelona – 25th February 2019: Planet Computers, in conjunction with mobile software developer Auxens, announces the availability of OXI for the Gemini PDA. OXI is an Android-based virtual operating system that enables users to run both mobile and virtual applications in a multi-window desktop environment. By connecting the Gemini PDA to an external display, OXI provides a fluid desktop user experience: reducing mouse latency and enabling easier access to CPU resources, as well as providing the ability to launch business applications such as Adobe Photoshop and Microsoft Office. OXI enables users to edit documents and complete multiple tasks simultaneously in different windows, while still being able to use the Gemini’s large 5.99-inch screen – including the ability to take calls and send/receive messages. The Gemini PDA links to an external secondary HD display and runs OXI via Gemini’s USB-C to HDMI accessory. Windows can be resized full screen with the touch of a button for maximum productivity and to streamline workflows. Push notifications appear on the right hand side of the desktop display, so users never miss the latest notifications. 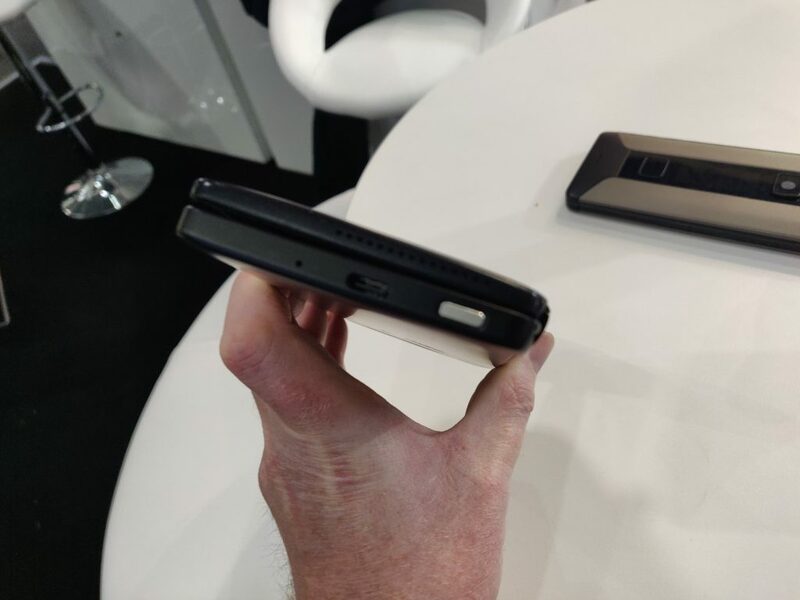 Mobile World Congress, Barcelona, 26th February 2019: Planet Computers and Jolla jointly announce the availability of the official version of Sailfish X for the Gemini PDA. Sailfish X is a downloadable version of Sailfish OS, the popular alternative mobile operating system. The Sailfish community offering is now extended to include a fully supported version of the Linux-based Sailfish OS for the Gemini PDA. The official Sailfish X software package features a suite of advanced functions, including seamless over-the-air (OTA) OS updates, Jolla Store access, end-user support, Microsoft Exchange support and, crucially for Gemini users, support for landscape user-interface (UI). The cost of Sailfish X for Gemini is €29.90 (incl. VAT) and it is currently available for customers within the EU, Norway & Switzerland. One of the most popular Indiegogo projects of 2017-2018, raising more than $2.5 million, Gemini re-imagines the PDA in a clamshell mobile device with a fully functioning physical keyboard and a large (5.99 inch) multi-touch colour display. Gemini enables users to type emails, blogs and social media posts easily on the go. The post MWC – Cosmo Communicator and Gemini Updates is original content from Coolsmartphone. If you see it on another news website, please let us know. A strange one this. The upcoming P30 Pro flagship, which hasn’t been launched, got shown off to Digital Trends today. However, there were a few caveats. First, they couldn’t take a photo of the front, second, it wasn’t actually the real device – it was actually a dummy model and also the fact that this might not actually be the colour you’ll be getting. Apart from that though, this is your first look at the new phone. 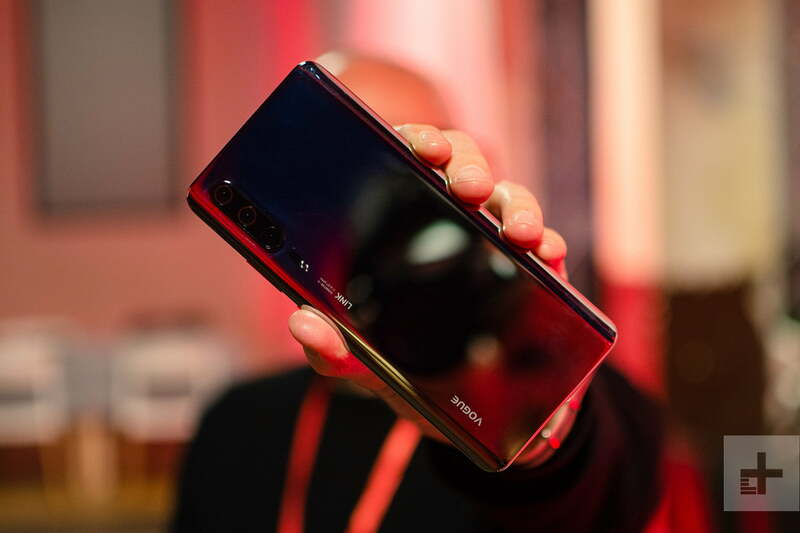 We presume they’re hiding the front because of an in-display camera or other type of trickery but what we do know is that it has the Huawei codename (Vogue) and the Leica codename (Link) slapped on the back. Three cameras, no doubt different lens types, sit on the elevated section of the back, dual speakers down the bottom (plus USB-C) and possibly 5G on the inside. More as we get it, but this is all that’s really known right now. 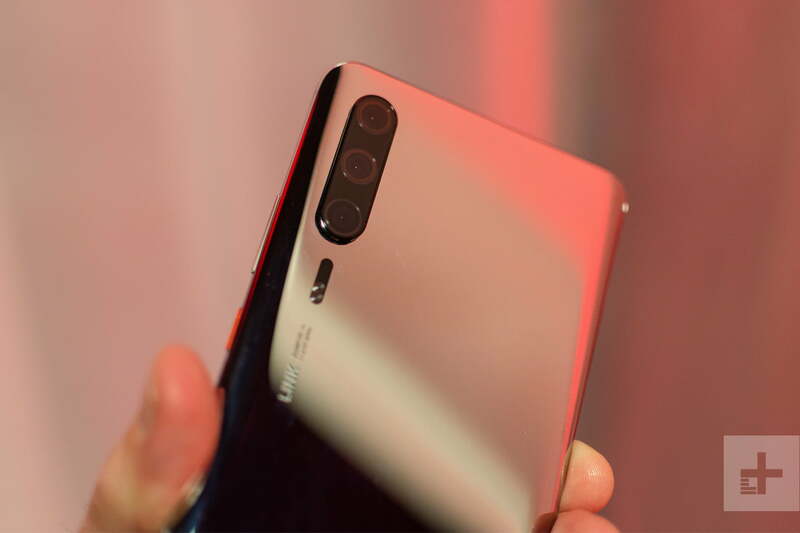 The post MWC – Huawei P30 Pro appears is original content from Coolsmartphone. If you see it on another news website, please let us know. 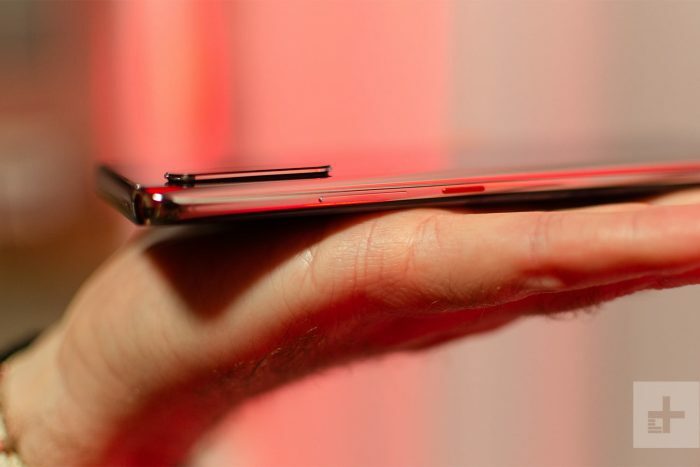 We’ve seen foldable phones in Barcelona, and – in years past (actually, it was 2016!) – we’ve seen flexible displays. 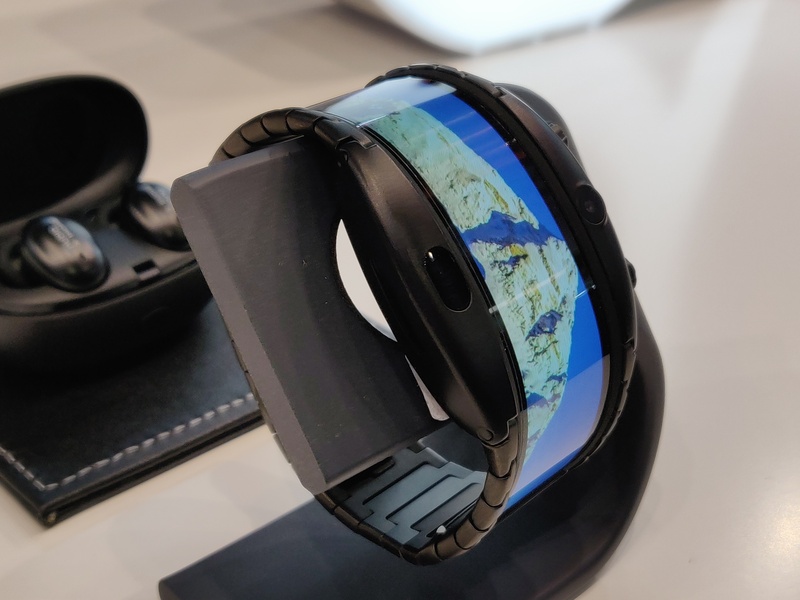 The latter was actually first brought to our attention as a possible wearable by FlexEnable but they didn’t have the necessary capacity to make it a full-on production device. Now though, from numbia, is this – the Alpha. It’s a wearable phone with a 4″ wrap-around display, and WiFi, Bluetooth – all the bits you’d expect. No need for a separate smartphone to hook into – this has an eSIM and lets you send texts, make calls and access the internet. You can also take photos with the 5 megapixel camera or do video calls. They’ve tested that screen with over 100,000 flexes, so it should be sturdy enough. It’s water-resistant sop you can use it in the shower and is made with stainless steel. It’s powered by a Qualcomm Snapdragon Wear 2100 CPU and has a 500mAh battery which is charged off a magnetic charging base with quick-charge tech. It’ll run for 48 hours on standby and, in addition to being a phone, it’ll also do all the smartwatch activity like activity tracking and sleep logging. 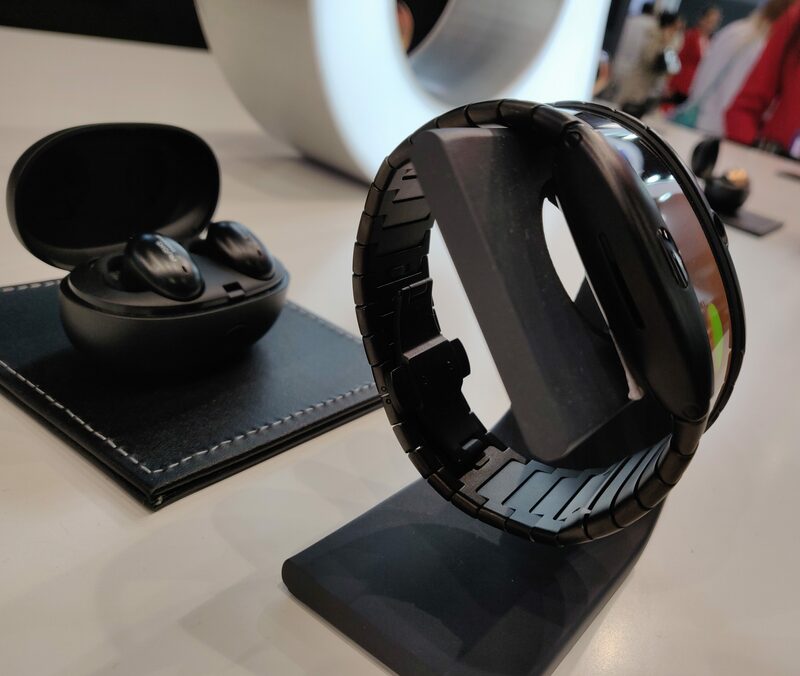 Along with the eSIM smartphone version, there’ll also be a Bluetooth version available in April for €449, which will probably work out at £399. The 4G version looks to be arriving at the same time, albeit in China first (Europ in Q3 and North America in Q4) for €549 (probably £499) if you want the black or €649 for the Gold plated (probably £599). 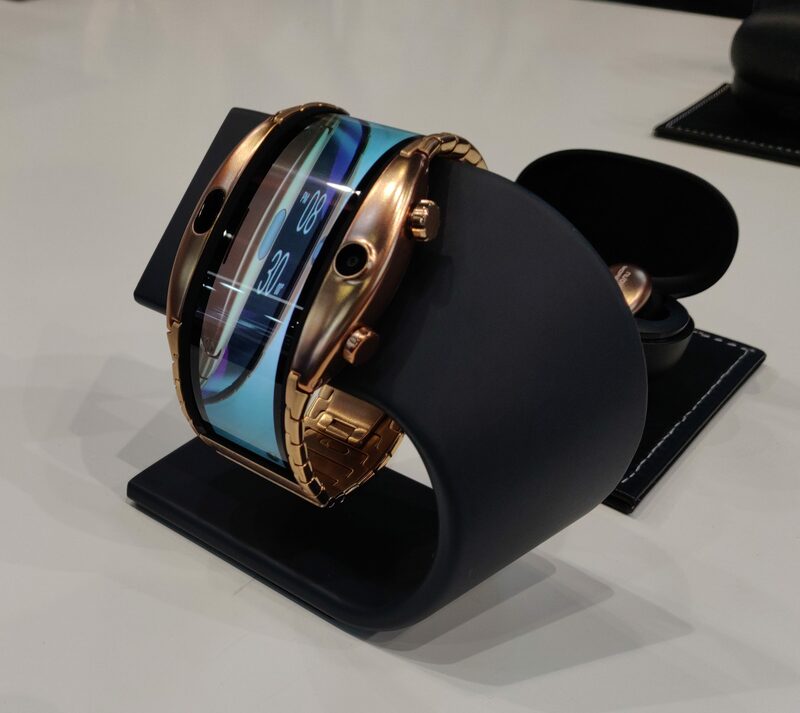 The post MWC – Meet the nubia Alpha wearable phone is original content from Coolsmartphone. If you see it on another news website, please let us know. Nokia’s new flagship phone has a crazy array of five cameras on the back, which use technology from Light to produce images with impressive quality and unique features. It’s also a nice flagship phone in its own right, finally bringing the Nokia brand back to the high end of the market. What does it feel like to hold? What’s it like to use the camera? We checked it out.